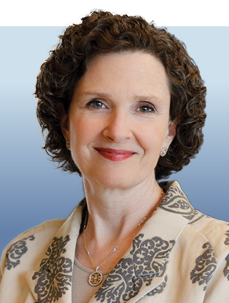 Joyce A. O’Shaughnessy, MD, is chair of Breast Cancer Research and the Celebrating Women Chair in Breast Cancer at Baylor-Sammons Cancer Center. She is chair, The US Oncology Network, and is a member of the Scientific Advisory Board for the US Oncology Research Network. Helped bring to the market capecitabine and gemcitabine, cytotoxic agents that are now among the most widely used in treating patients with breast cancer. Developed the School of Breast Oncology®, now in its 14th year, and the International Congress on the Future of Breast Cancer®, entering 17th year, both CME meetings for breast cancer specialists sponsored by Physicians’ Education Resource (PER®). Examined clinical trial concepts and protocols during her 2 years at the NCI’s Cancer Therapy Evaluation Program (CTEP). Delineated new cancer drug approval endpoints with NCI and CTEP while a special assistant to the NCI director. Helped establish the NCI-FDA Fellowship Training Program. Chaired the AACR Task Force on Treatment of Intraepithelial Neoplasia (IEN), which published clinical trial strategies to accelerate development of new agents for IEN.